Tickets: Adults $20, Students/Seniors $15. Group Rates Available. Please call 845-709-2273 to reserve tickets. Send email to info@hudsonlyricopera.org. Venue: Trinity United Methodist Church, 47 East Main St., Stony Point, NY 10980 in Rockland County. Click here for directions, here for parking. 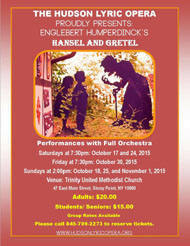 Hansel and Gretel is a 3 act opera composed by Engelbert Humperdinck in the late 1800s. This fairy-tale based opera was first performed in 1893, and is well known for its folk music inspired melodies. 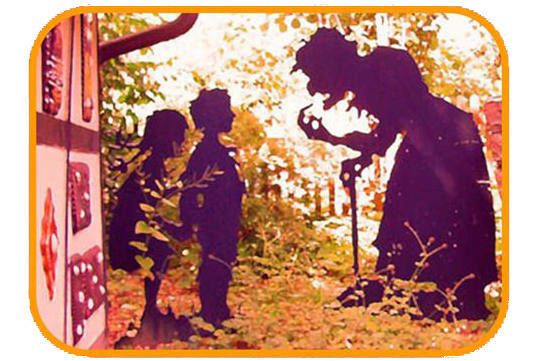 Hansel and Gretel is based on the famous German fairy tale as recorded by the Brother’s Grimm. It is the story of a brother and sister who get lost in the forest where they encounter a witch living in a house constructed of cake and candy. It is a favorite of children of all ages and great way to have Halloween fun. The opera will be performed in English with orchestra, sets and costumes. Joining the opera company are Rebecca Balbach and members of the Balbach School of Dance. The Hudson Lyric Opera, now in its tenth season, is comprised of many talented artists who live or work in the lower Hudson Valley.